As I headed out on my cross-country tour for my first book, I made a pact with myself to stop at as many non-corporate diners, truck stops and restaurants as I could. That’s how I found myself at a non-descript truck stop somewhere in the Sonoran Desert on the east side of Arizona. No one else was inside, save for a bored clerk watching daytime television with one eye, and me with the other. I expected to find a few local specialties, and maybe even some of the pinon pine nuts so famous in the region. I was not disappointed: I found locally made jerky and sausages, lots of dried fruits, and some honey. But no pine nuts; too early in the season, the clerk told me. I stocked up for the road, and lemme tell ya those fresh dates and antelope jerky hit the spot all the way to Austin. I also bought a quart of dark desert wildflower honey. To idea of saving the ephemeral treasure of a desert in bloom seemed magical, and the aroma of the honey hit me like a silken fist. From time to time on my journey I would just open the jar and inhale. I never did find any roadside pine nuts on my trip. But I do know where to harvest real, American pine nuts — on the eastern side of the Sierra Nevada. Pinus monophylla are large, and they crack easily. American pine nuts are vastly superior to any other variety, with the possible exception of Italian stone pine nuts. Neither variety will give you that horrible “pine mouth,” which you get when some unscrupulous Chinese manufacturer taints Korean pine nuts with some other Asiatic pine nut that causes pine mouth. Pine mouth, incidentally, will make everything taste metallic for days. Somewhere along my endless book tour the kernel of an idea lodged in my mind: Pine nut ice cream, sweetened with this desert honey. My first crack at this ice cream failed, I should tell you. For whatever reason I only added about 1/3 of a cup of honey and only 2 egg yolks. The ice cream turned out icy. So I let it melt, heated it up again and added more honey and egg yolks, then rechurned it. Yes folks, if you did not know you can rechurn ice cream, now you know. Thought I might pass that bit of knowledge on. We ate the ice cream for Christmas dinner, and it was smooth, very rich and pleasantly sweet without being cloying. 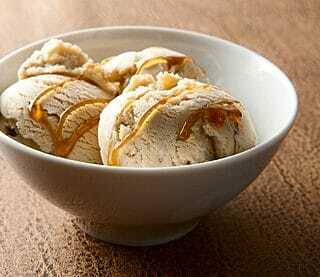 The pine nuts, which can be a little soft at room temperature, harden up in the ice cream and provide a nice crunch. I used the last of my desert honey to make this ice cream, and now it’s gone. I’ll hold the memory of it inside until I hit the road again. And given the life I live, that won’t be long. Pine nuts and honey are a great combination, and you don't need to get an esoteric honey for this recipe. And while I use American pine nuts, you can use any pine nuts -- just beware that 95 percent of all store-bought nuts are from China, and they can potentially contain "bad" nuts that cause pine mouth. I will still use the Chinese nuts from time to time, but for me it's worth cracking my own American nuts. Italian stone pine nuts are an excellent, if expensive, alternative. Toast the pine nuts in a dry pan on medium-high heat until they begin to brown. Keep an eye on them, as pine nuts can burn very easily. As soon as they start to brown nicely, move the nuts to a bowl and set aside. Put the pine nuts and the remaining ingredients (except the egg yolks) into a heavy pot and heat to steaming over medium heat. If you have a thermometer, you want the cream to get to 160°F or so. Turn off the heat, cover and let steep for 1 hour. Refrigerate until cold, up to a day. Strain the mixture and discard the vanilla bean. Save the pine nuts and reserve. Reheat the cream mixture over medium heat to 160°F. Beat the egg yolks slightly in a bowl. Now, using two hands -- one with a small ladle, the other with a whisk -- slowly pour in some of the hot cream into the egg yolks, using your whisk hand to whisk in the hot cream. Do this a little at a time so you don't scramble your eggs. After you have 2-3 ladlefulls in the egg yolk bowl, start whisking the hot cream mixture in the pot. Slowly pour in the hot egg yolk-cream mix and whisk well. Allow this to cook below a simmer, stirring often, for 5 minutes. It will thicken. Strain the mixture once again and chill. Once chilled, pour it into your ice cream maker. Allow the ice cream to churn until it's a soft-serve consistency. 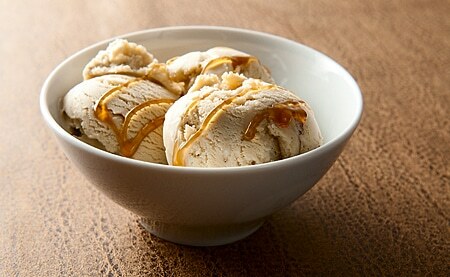 Move the ice cream to a large, chilled bowl and fold in the pine nuts. 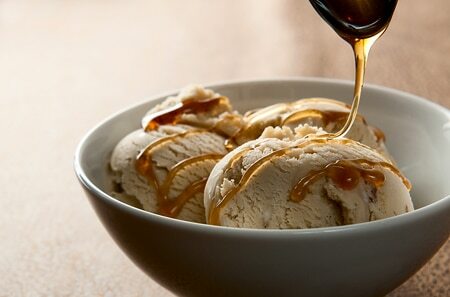 Chill hard, then serve with some honey drizzled over the top. Note that prep time does not include the chill time for the custard. 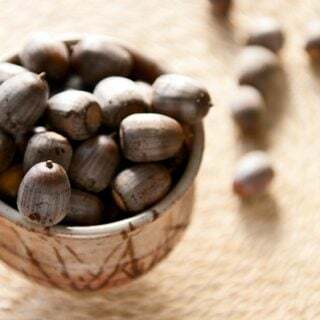 Find more recipes for American pine nuts, as well as lots of other wild nuts and wild starchy things, right here on Hunter Angler Gardener Cook! Wow, thanks for sharing this! I’ve never made ice-cream, but am very keen to try! Wonderful – I just bought a bag of pine nuts on impulse the other day. And Mr. Bird owes me a jar of honey. Hank, I had the same issue with honey ice cream – either too icy or too globular. I will try the melt-and-rechurn technique if that happens again. Thanks for being the experimenter! This was my first attempt at making ice cream. I found a guy selling Utah pine nuts on the side of the road here in San Diego. My thumb is still raw from shelling and peeling all of those nuts (there has got to be an easier way). Used honey from some hives that are out by my turkey hunting spot. This recipe was great. Mild earthy flavors, not overly sweet like store-bought. So far this website and your book have not let me down. Every recipe I try is a keeper.